Cigarette Twin Step 42 Tiger: Brawney racer delivers roaring performance. As anyone who likes to charge hard in nasty offshore water can tell you, sizes does make a difference. 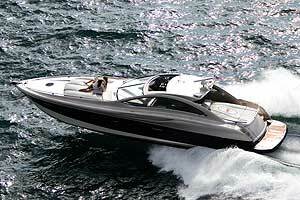 Precious few "small" offshore boats can run in the offshore rough without turning your spine into a conduit for pain. And yet, so many big offshore boats, say, those longer than 40 feet, tend to lumber. They're great at blasting through swells, but not exactly a blast to drive. 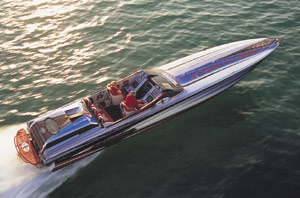 The Cigarette Twin Step Tiger is one of those rare boats that blends wave-crushing ability with mind-bending agility. At 41'8" long, not counting a swim platform or pointy snout, and 8' wide, the boat can run right over swells, or simply dart around them. 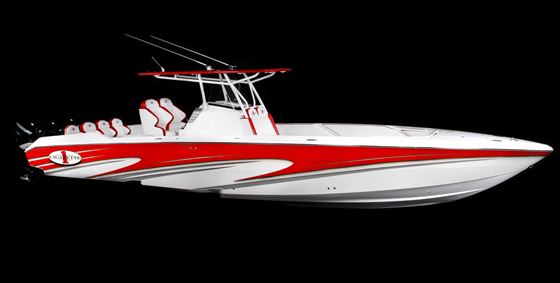 When it comes to the latter quality, that's saying something for a 42-footer. Base price for the Twin Step Tiger, close cousin of the conventional deep-V 42 Tiger, with twin Mercury Racing HP500EFI motors is $345,000. 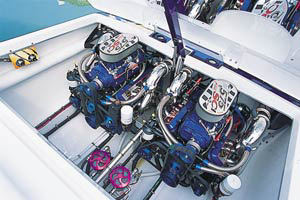 Our test boat came equipped with hotter stuff, namely a pair of Mercury Racing HP575SCi engines. That upgrade, plus a few more goodies, bumped up the price to $420,228. 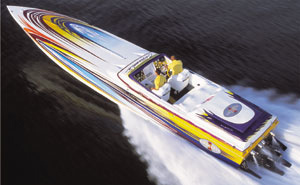 Twin 575-horsepower HP575SCi engines from Mercury Racing provided the power. When the stepped-bottom craze was in full bloom, the people at Cigarette Racing Team watched and waited, knowing they had a stable of legendary V-bottoms. The company decision-makers eventually decided the time was right, and renowned designer Michael Peters came up with the Twin Step Tiger plan. The boat's first step was positioned 15 feet forward of the transom, the second about 6 feet aft of the first. Of the hull's four staggered strakes, only the outer pair ran full length. The inner set terminated at end of the forward-most running plane. Harnessing the energy from the two 550-hp, supercharged and fuel-injected motors were Bravo One XR drives with 1.5:1 ratios. Bravo One 15 1/4" x 30" four-blade stainless-steel propellers put the combined 1,100 horsepower to the water in impressive fashion. 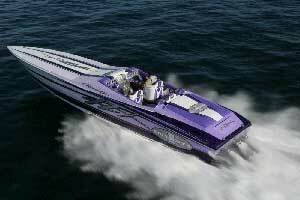 Top speed for the 9,600-pound boat was 86.9 mph at 5300 rpm. 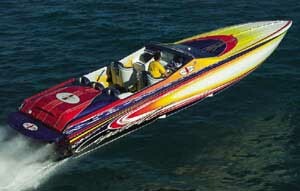 The Twin-Step Tiger's time to plane of 4.3 seconds was pretty swift given the size of the boat. However, the boat did point its noise in the air at a fairly severe angle during that time. 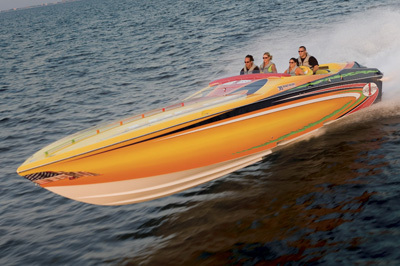 In 10 seconds, the boat ran 51 mph and in 20 seconds it reached 75 mph. We found plenty of snap in midrange acceleration tests. The Twin Step Tiger popped from 30 to 50 mph in 5.3 seconds and from 40 to 60 mph in 6.7 seconds. 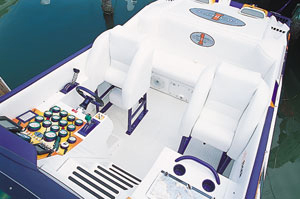 "Throttle response is excellent for a boat this size," said our lead test driver. You don't often hear the word "nimble" applied to 42-foot offshore performers, but our test driver used it often in reference to the Twin Step Tiger's handling manners. Although it was a little too long to slalom crisply at 30 mph, it knifed precisely through those maneuvers at 40 and 50 mph. The boat was particularly impressive in circle turns at cruising and full speeds. It felt glued to the water, even in sweeping turns at 70 mph. Our test team couldn't find conditions nasty enough to challenge the 42-footer. The best (or worst) the Gulf of Mexico off Captiva Island, Fla., could offer on test day was 2- to 3-foot wind chop, and the boat just crushed it—from all directions. When our test driver did find a large enough swell to launch from, the boat flew with a level attitude. It landed softly and—always a good sign in terms of construction—quietly. Cigarette wouldn't divulge much about the Twin Step Tiger's lamination schedule. What a representative from the manufacturer did tell us was that the process involved vacuum-bagging, and that materials included Vinylester resin, Deco Lite bulkheads and Presma Beam stringers. What we could see with our own eyes, however, certainly was impressive. Gelcoat and paint work were exquisite. Mold work was close to perfect, and that's saying something considering the boat's long, flat deck, where imperfections are easily seen. As much an aesthetic element as brawny protection, the stainless-steel rub rail was neatly installed. The manufacturer appropriately outfitted the Twin Step Tiger with hardware, including an assortment of Accon Pop-Up? cleats and rail running down the deck. Rather than a windshield, the boat had a wind faring with a deflector lip. To get air to the supercharged motors, the engine hatch was equipped with molded scoops and Nacka ducts. Mirrored on the underside, the hatch itself opened on a single hydraulic ram for great access to the motors. The engines were properly secured on cradle mounts and L-angles through-bolted to the stringers. Arranged in parallel fashion, all wiring, hoses and cables were supported by stainless-steel and aluminum cushion clamps. Even the clamps themselves were aligned. Wires and cables from the helm were channeled to the engine compartment through PVC tubing. Overall, the rigging for the Twin Step Tiger was among the best we saw during our 2001 Performance Trials. Stout bolsters were supplied for the driver and copilot. 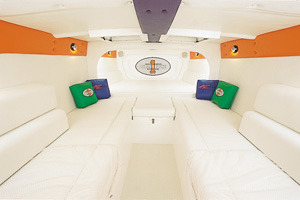 The cabin layout included long facing lounges and a generous berth. The Cigarette folks took an interesting tack with the Twin Step Tiger's V-berth: They suspended it on canvas, much like the tarp area between the sponsons of sailing catamaran. The result was a shock-absorbing sleeping area. More conventional, the facing lounges in the cabin were upholstered in vinyl and had embroidered Cigarette 42 Tiger logos. Another stand-out feature in the cabin was its indirect lighting, which created an elegant atmosphere when the electric cabin door was closed. For natural light and ventilation, the cabin was equipped with deck hatches. In the cockpit, the Twin Step Tiger boasted stout bolsters for the driver and co-pilot and a four-person bench for additional passengers. To port, grab handles, a glove box and two cup holders were within easy reach of the co-pilot. Without question, the highlight of the boat's interior was its helm station. Gauges were of the Gaffrig Monster breed, including a 100-mph liquid-filled speedometer. A Garmin GPS unit, as well as an electronic compass, was supplied for navigation. All instruments were arranged around an attractive Dino steering wheel. Drive- and tab-trim switches were set in the left-hand position, with Latham Marine throttles and shifters in the right-hand position. Mercury mechanical indicators were supplied for the drives and tabs. 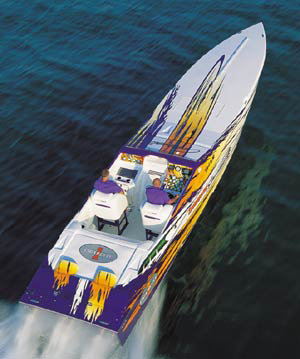 The Cigarette name is so legendary that it has become a generic term for offshore performance boats. That's a lot to live up to. No problem. The Twin Step Tiger can handle it. Propellers Mercury Bravo One 15 1/4" x 30"
Hydraulic engine hatch, full instrumentation, Latham hydraulic steering, Latham throttles with trim, GPS system, deluxe stereo, shore power with battery charger, 30S trim tabs, Marine Machine sea strainers, Borla exhaust mufflers, freshwater flush system, freshwater shower. Upgrade to Mercury Racing HP575SCi engine package including custom sea strainers, primer pumps, air intakes on engine hatch and custom exhaust mufflers ($50,035), Lip-Ship Edition Dress-up Package comprised of custom graphics, full dress engine compartment, matching hardware, prop test and sea trial done by Phil Lipschutz ($25,000).